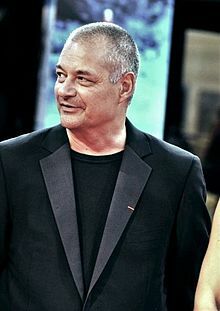 Jean-Pierre Jeunet (born 3 September 1953 in Roanne, Loire, France) is a French movie director. Jean-Pierre Jeunet bought his first camera at the age of 17 and made short movies while studying animation at Cinémation Studios. He made friends with Marc Caro. Caro was a designer and comic book artist. Caro worked on many of Jeunet's movies with him. Together, Jeunet and Caro directed award-winning animations. Their first live-action movie was The Bunker of the Last Gunshots (1981). It was a short movie about soldiers in a futuristic world. Jeunet also directed numerous television advertisements and music videos. Jeunet and Caro's first full length movie was Delicatessen (1991). It was a black comedy set in a famine-plagued future. Next came The City of Lost Children (1995). It was a dark fantasy movie with a story about a doctor who kidnaps children in order to steal their dreams. Because The City of Lost Children was well liked, Jeunet was asked to direct the fourth movie in the Alien series - Alien: Resurrection (1997). Though not well received by critics, Alien: Resurrection turned a profit at the box office. Jeunet returned to France after making Alien: Resurrection. The fact that he had made a Hollywood movie gave him freedom on his next movie, Amélie. Amélie is lighter and more romantic than his earlier movies. This story was a huge success worldwide. It was nominated for several Academy Awards. For this movie he also got an European Film Award for Best Director. In 2004, Jeunet released A Very Long Engagement. It is based on the novel by Sebastien Japrisot. The movie is set after World War I. It is about a woman (played by Audrey Tautou) looking for her missing lover. This page was last changed on 3 July 2018, at 05:52.